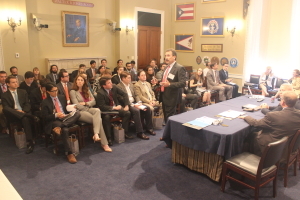 During the week of 11 April, IADC members and staff hosted a Lunch and Learn event on Capitol Hill and met with several US Senators and Members of Congress. 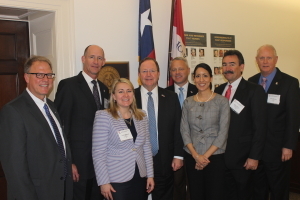 Jay Minmier, President, Nomac Drilling; Mike Garvin, Senior Vice President, Operations Support, Patterson-UTI Drilling Company; Joey Husband, Vice President Global Operations, Nabors Drilling Solutions and Scott McKee, Contracts and Marketing Lead, Cactus Drilling Company, along with Liz Craddock, IADC Vice President, Regulatory and Government Affairs and Melissa Mejias, Legislative Assistant, hosted the 12 April “IADC Onshore Drilling 101” Lunch and Learn for more than 60 attendees. 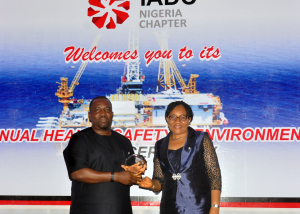 The IADC Nigeria Chapter recently awarded excellence in safety to several chapter members during it’s annual HSE awards ceremony. Overall winner was Oando Energy Services. Mr. Bandele Badejo accepted the award on behalf of the company. 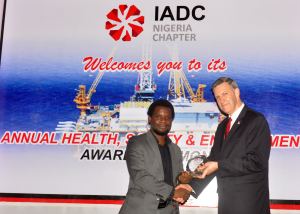 Mike DuBose, IADC Vice President, International Division, presents Mr. Tunji Adenuga of Indigo Drilling with the award for best improved company during the IADC Nigeria Chapter’s annual HSE awards ceremony. 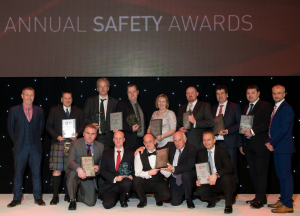 Members of the International Association of Drilling Contractors (IADC), North Sea Chapter gathered for its Annual Safety Awards Ceremony on 22 April 2016 at the AECC, Aberdeen. Ivor McBean, Diamond Offshore, and Gary Holman, Awilco Drilling, Co-chairs of the IADC North Sea Chapter welcomed a large turnout to the event. Guest speakers on the evening were IADC President Jason McFarland and Steve Rae, Vice President QHSE, Archer. “Everyone is aware of the extremely difficult times the industry is facing and despite the challenges and uncertain future in terms of oil price and activity levels, the industry will continue to focus on the most important aspect of our business – the safety of our personnel,” said Ivor McBean. A number of awards were presented to companies and installations for their safety record over the last year with the awards for best safety performance in 2015 going to Noble Drilling and Ensco in the Jack-ups category; Stena Drilling in the Floating Rigs category and Odjfell Drilling in Platform drilling. Chairman’s Awards, which recognize individual rigs and their crews that had the best safety performance in 2015, went to Maersk Innovator, Maersk Drilling (Jack-up); Deepsea Atlantic, Odjfell Drilling (Floating Rig); and Dunbar, KCA Deutag (Platform). The Associate Member Award was presented to Blaze Manufacturing Solutions. The event was hosted by broadcaster and Deacon Blue drummer Dougie Vipond with entertainment from comedian and presenter Des Clarke. Funds raised on the evening will be donated to Macmillan Cancer Support and the UK Oil & Gas Chaplaincy Trust. A special donation will be made to VSA by The Val Hood Award, which was established in honor of a former colleague. IADC North Sea Chapter Safety Awards Winners and Runners-up 2016. In a significant court decision that is a victory for drilling contractors, the English Court of Appeal ruled in favor of Transocean with regard to how drilling contract consequential loss clauses should be interpreted. In 2014, the English Commercial Court ruled against Transocean in a case involving an Irish operating company. The operator in the case alleged that Transocean was responsible for paying the operator’s spread costs associated with unplanned downtime. The ruling had far-reaching implications, as it held that drilling contractors could be responsible for operator spread costs during major contractor downtime events. In response, Transocean began the process of appealing this specific portion of the ruling. IADC lent its support to a petition to the court on behalf of industry asking the court to grant Transocean an appeal. “IADC supports its members when it comes to the integrity of drilling contracts. In this case, we worked closely with Transocean to submit documents that supported Transocean’s stance,” said Jason McFarland, IADC President. “The decision of the appeals court last week is a significant win for Transocean and for drilling contractors globally”. 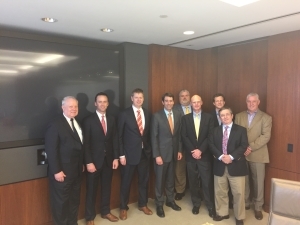 On 30 March, several IADC members met with Louisiana Congressman Garret Graves at Rowan’s Houston offices to discuss general drilling issues in the Gulf of Mexico and the BSEE well control rule. From left: Alan Spackman, IADC; Jason McFarland, IADC; Tom Burke, Rowan; Congressman Graves; Chris Johnston, Ensco; Pharr Smith, Rowan; Mike Lawson, Rowan; David Faura, Rowan and Michael Clark, Rowan. On 9 March, Mexico’s National Hydrocarbon Commission (CNH) met with IADC to obtain industry input on CNH’s regulatory priorities. Juan Carlos Zepeda Molina, the President Commissioner of the CNH, said he hopes the cooperation between the two groups will help CNH to develop more robust regulations for Mexico’s upstream industry. Click below to watch a video of Mr. Zepeda outlining CNH’s goals for the coming year and its efforts to be a transparent and reliable organization that will earn the trust of the Mexican people. Ronald E Sweatman, author of “Well Cementing Operations”, published in 2015 by IADC, was inducted into the American Association of Drilling Engineers Hall of Fame on 12 April. Mr Sweatman was recognized “for his significant contributions to the advancement of cementing and other well services through patented technologies and numerous publications”, AADE said. The induction occurred during the AADE 2016 National Fluids Technical Conference, held 12-13 April, Houston. “Well Cementing Operations” is the most comprehensive and in-depth treatment of cementing available. The book covers techniques and developments never before published in a single source – overview of basic well-cementing theory, best practices and real-world applications, calculations and problem-solving exercises. Historically available only through experience or industry short courses, the information contained in this handbook is a valuable learning tool for readers at all levels. Published under the auspices of the IADC Technical Publications Committee. Mario Zamora: For his pioneering work in hydraulics, rheology, barite sag, software development and his leadership role in the fluids industry. To view a video of Mr Sweatman discussing “Well Cementing Operations”, go to www.iadc.org/technical-resources and scroll to the bottom of the page. The book is available through the IADC Bookstore and, in electronic format, through the IADC eBookstore. 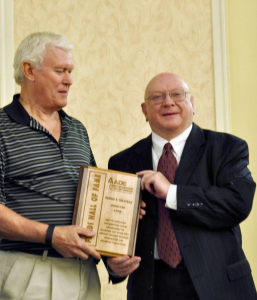 Ronald Sweatman (right) is inducted into the AADE Hall of Fame. The honor was bestowed Tom Carlson. In April, the United States District Court for the Eastern District of Louisiana ruled definitively that BSEE cannot enforce criminal liability under the Outer Continental Shelf Lands Act (OCSLA) against offshore contractors. The question of contractor liability in the case arose from litigation related to the Black Elk Energy offshore incident, which occurred in 2012 off the coast of Louisiana. The Court held that the plain language of OCSLA and its regulations do not support a criminal charge against contractors, an argument that drilling contractors have been advancing for several years. Also of note, the appeal to the Interior Board of Land Appeal’s Island Operating Co. opinion, which affirmed BSEE’s civil penalty authority over contractors under OCSLA is now on appeal in the Western District of Louisiana. The Eastern District Court voiced it hesitancy to allow the contractor defendants to be criminally prosecuted for OCSLA violations when it has not yet been established that they can be subjected to civil penalties. The government has until mid-May to appeal the case.